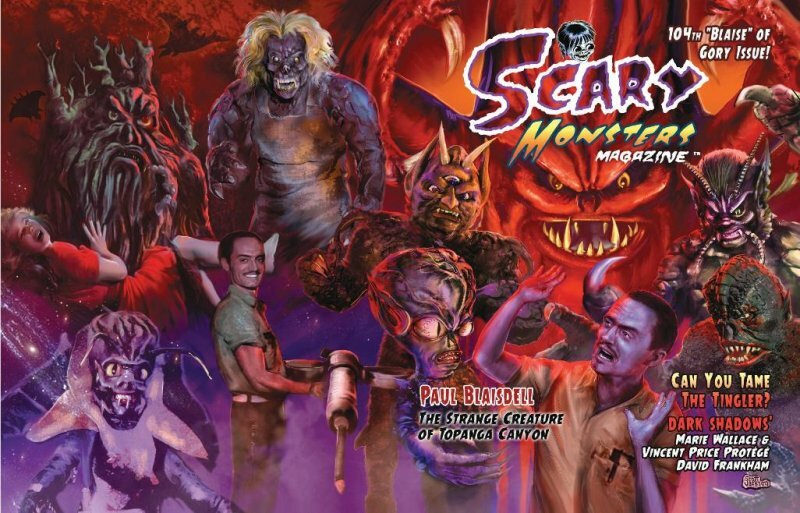 Scary Monsters Magazine #104 is our Blaise of Gory Issue! Feature articles include Paul Blaisdell: The Strange Creature of Topanga Canyon (Part 1), Can You Tame the Tingler?, and Gravesy Gravesem's American Chop 40 Monster Hits Edition, and more! 144 pages of all classic horror and sci-fi! In #104 we highlight the quintessential creator of monsters for B movies in the 1950s. Paul Blaisdell was a one-of-a-kind monster maker who literally stepped inside his own creations, bringing them to life before the cameras and movie-goers worldwide. We also ask, "Can You Tame the Tingler?" in a review of the William Castle-Vincent Price shock-fest from a scientific perspective. Then there's our music-monster mash up with "Gravesy Gravesem's American Chop 40 Monster Hits Edition." Godzilla fans will appreciate a convenient guide to the 29 G films released by Toho. We also visit with Dark Shadows alumna Marie Wallace and Vincent Price protege David Frankham of Return of the Fly, Tales of Terror, The Outer Limits, and Star Trek. And there's much, much more in 144 vintage pulp pages for Monster Kids of all ages! Can You Tame the Tingler? Advertisers and Catalog of Scary Stuff! Full color cover and vintage B&W content. 144 pages plus cover. Published April 2017 by MyMovieMonsters.com. Now enjoy Dr. Gangrene's sneak preview of Scary Monsters #104!